The Browning Fishing Midas is no longer available. To find a comparable reel, please use the menu to the left. 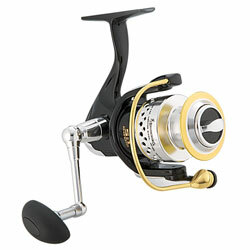 "Best reel I've not only purchased but the best reel i"ve ever used! so smooth and great retrieve"
"I recently purchased this product from bass pro, It seemed to have high ratings at the time. I got the combo. If you look at the price te rod is junk for $130+ and the reel completly siezed up after one run from a bull red." "I bought this reel last summer to put put on my G-Loomis rod. I wanted a nice spinning reel to accompany my high end rod, and since it was on sale, it was an easy choice. " "I bought the midas 2500, last years model on sale for $79.99. It was the most expensive reel I had ever purchased. I mean why not, it was half price. The first time I took it out, I couldn't believe how far off shore my cast went."